A recent research report by Alton Towers has suggested that Brexit fears will increase the spending by Brits on leisure activities. Brits will cut down on costs elsewhere, to prioritise spending quality time with loved ones. “Cut down costs elsewhere” also means cutting down costs on retail. Vintage has never been more popular. Charityware chic, the jumble sales that sell by weight, initiatives like Katapult’s Table of Joy (each week we bring in our unwanted items and see if anyone else in the office can make use of them! ), it’s never been easier to re-love clothing. We are seeing a trend in streetwear for clothes of a hardwearing nature. Brands like TheNorthFace, Patagonia, Dickies, Carhartt and skate brands like Palace and Vans are on the backs, legs and feet of the world’s most stylish. CLOTHES WILL LAST, WILL THE HIGH STREET? Yes, fashion is in constant rotation, but whether they are intending to or not people are buying clothes that last. If money is on lockdown, and we are prioritising our spending, will we be buying a new winter coat every year? If people are buying clothes that last, or are vintage, does that mean throwaway fashion in the UK is nearing its end? What does that mean for the High Street and shopping centre stores? What should you do to save yourself? Take a leaf out of Museum Lates book. Use the season extending power by opening your store for a different purpose. Mod favourites Dr Martens and Fred Perry have both turned their stores into late night music venues. Turn your store into a museum or art gallery. After all, the garments you sell are works of art, right? That’s exactly what Dover Street Market have done. They have a few stores around the world (including London, and LA), and the way they display their clothing is like walking into an art gallery. And in fact, some of the installations are specially commissioned. Do you operate in one of the big shopping malls? How about trying a pop-up market stall? Or are you an online store? How about moving to the high street? Now that might sound counter-intuitive. But it’s exactly what ProDirectSoccer.com have done with their Carnaby Street store. 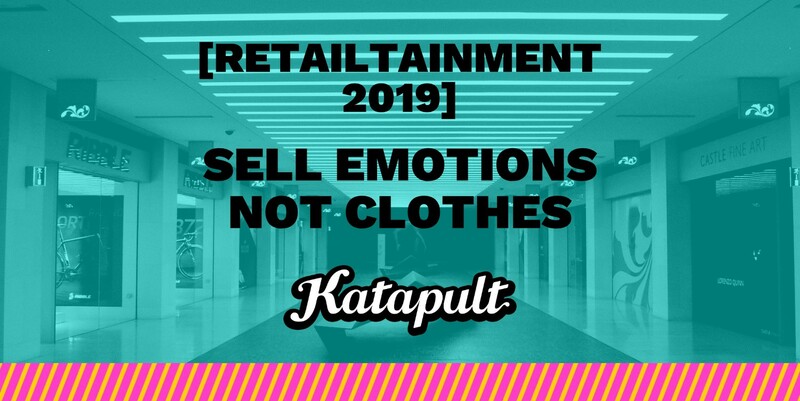 It’s a place where their customers can interact with their brand, touch and feel the garments that would normally be behind a screen. Or maybe like the Puma store, team up with other brands to extend your offer. Like allowing YouTube channel Copa90 to host interviews from the store. If your customers take the plunge and spend big on an item of clothing, they will want to wear it more than once. How about those sentimental items that hold so many joyous memories? Well, you can now dust them off and wear them again, like at this Wedding Dress Ball. If you want your guests to be saying things like that, have a chat with us. About the Author: Alistair is a Marketing Executive at Katapult – A Creative England, Top 50 Company that creates physical and digital guest experiences that amaze and engage your visitors.